UPDATED Mar. 5, 2019. 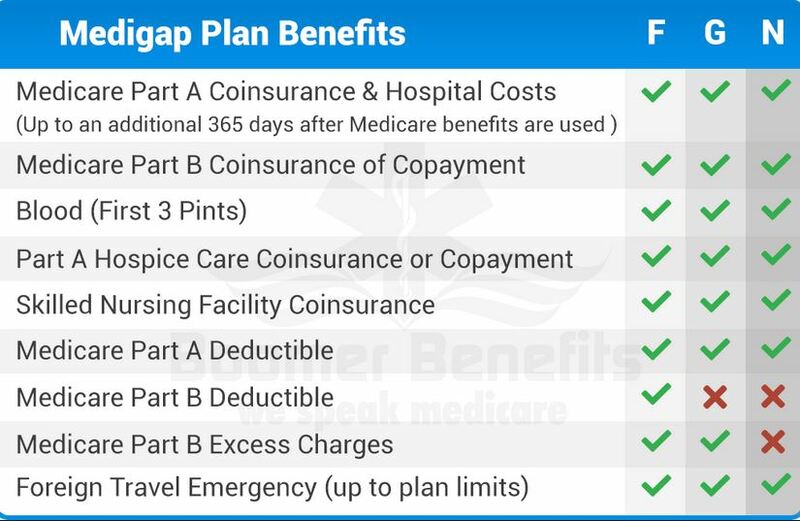 Medicare Supplement Plan G, also known as Medigap Plan G, covers all Medicare ‘gaps’ except for Medicare Part B Deductible. Just like all Medigap plans, the Medicare Supplement Plan G is standardized. 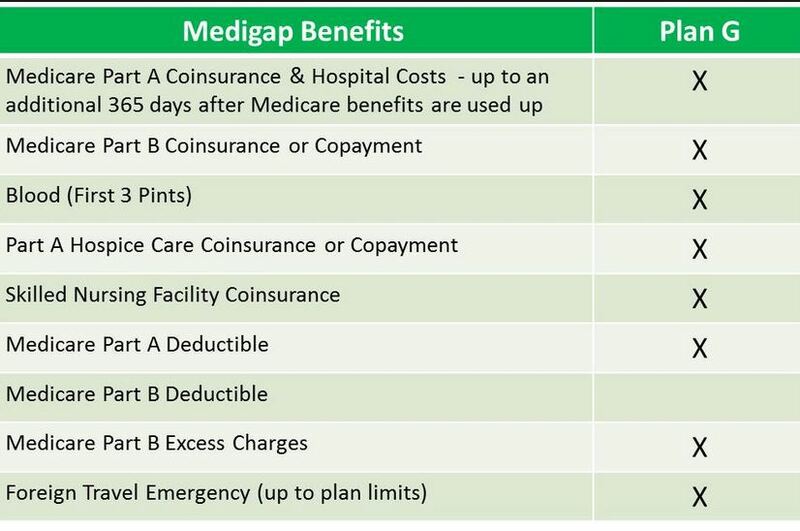 Most Medicare Supplement insurance companies are offering Medigap Plan G. Its benefits the same for any company offering the plan. However, you will notice that Plan G premiums vary quite extensively between companies. Here we’ll discuss the main reasons to choose Medigap Plan G in 2019. What does Plan G not include? Hospital Costs: Medicare Part A coinsurance plus 365 additional days after Medicare benefits are used. Medical Expenses: Medicare Part B coinsurance (20% of Medicare outpatient expenses) or copayment. Blood (the first 3 Pints per each calendar year). Medicare Part A Deductible: $1,364 per benefit period in 2019. Foreign Travel Emergency – Medically necessary emergency care services during the first 60 days of each trip outside the USA. You are responsible for the first $250 each calendar year. Medicare Part B Deductible: $185 per year in 2019. How is Medigap Plan G different from Plan F? Does any doctor accept the Medigap Plan G? Are Plan G benefits depend on Medigap vendor? The benefits of Medigap plans are NOT dependent on vendors. All Medicare Supplement plans are standardized, i.e., any plan bought from one company is identical to the same plan purchased from any other company. Plan G premium, however, may vary from vendor to vendor. What is Medigap Plan G coverage of Foreign Emergency? Medicare Supplement Plan G pay 80% of the billed charges for medically necessary emergency care outside the U.S. after you meet a $250 deductible per year. Medicare Supplement Plan G is the same with Medicare Supplement Plan F, excluding the fact that it does not cover Medicare Part B deductible. 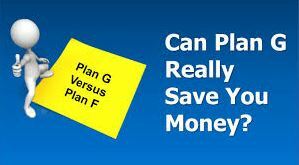 As long as the difference between plan F and plan G premiums exceeds the Part B deductible, it makes sense to go with Plan G.
Historically, annual premium increases of Medicare Supplement Plan F are higher than for Medicare Supplement Plan G. One of the reasons is that Plan G is NOT on the list of Medigap plans that may be purchased under Guaranteed Issue Rights. Therefore, people having Medicare Supplement Plan G, in general, are healthier than people participating in Plan F.
As of 2020, Medicare Supplement plans will no longer sell NEW Medigap Plan F. It will make Medicare Supplement Plan G even more attractive choice. Use Medicare Plan G (if available) when savings in premium justify removing Medicare Part B Deductible from the benefits. Read more in Medicare Supplement Plan G vs Plan F.
Considering the 10 Standardized Medicare Supplement plans, it may be not an easy task to select the right plan for you. Not all Medigap providers carry all of these plans, and the difference in premiums for the same type of plan among different vendors tends to be rather substantial. With the help of Liberty Medicare, find the Medicare Supplement plan that is best for your needs and budget. All our services are absolutely free to you. Learn more about all the benefits of working with Liberty Medicare. Get a free Medicare Supplement Insurance Quote, or feel free to call us at 877-657-7477. Our specialists are ready to answer your questions.